If you’ve spent time at UW, you probably know of the bronze plaque near the front doors of Bascom Hall. It calls for the “continual and fearless sifting and winnowing” of ideas. The Class of 1910 donated the plaque in 1915 as a class memorial. 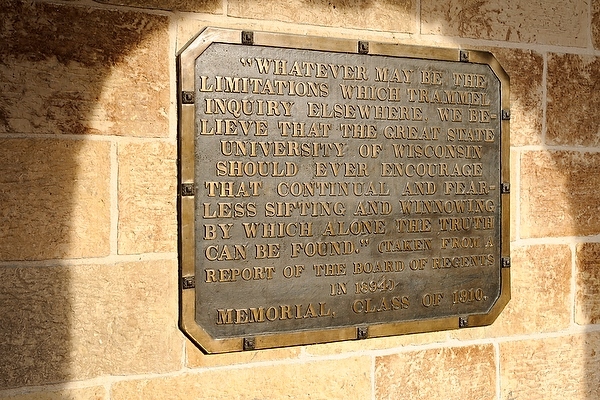 It commemorates the wording from the Board of Regents meeting of September 18, 1894 supporting Professor Richard Ely, who was accused of socialist, pro-union activities. 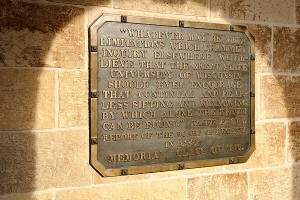 Our sifting and winnowing plaque is as relevant today as it ever was. In recent months, the American Studies Association has generated a great deal of media attention for passing a resolution calling for a boycott of Israeli higher education institutions. Though we have some faculty who belong to the American Studies Association, the University of Wisconsin at Madison does not have a traditional American Studies program. (Instead, we have a globally-focused cluster called Comparative U.S Studies.) We do not hold an institutional membership with the ASA. Nonetheless, I have also heard from many alumni and concerned members of the community asking if I supported or opposed the ASA’s action. Rather than debating the details of the ASA resolution, let me share my personal view of academic boycotts in general. I am a firm believer that faculty exchange and the free flow of ideas between higher education institutions is essential, and those principles have long transcended political disagreements or boundaries. Even at the height of the Cold War, scientific exchanges between the U.S. and the Soviet Union continued to occur. I further believe that it is never appropriate to punish scholars over political differences. As always, individuals should be free to express their personal views and any healthy academic community should tolerate (and even celebrate) the presence of people with widely divergent intellectual perspectives. I believe we should continue to encourage connection and collaboration in the pursuit of knowledge and oppose any efforts to restrict the ability of our faculty to work with scholars from other institutions around the world. Indeed, UW–Madison has active programs that promote exchange and study abroad with Israel involving our faculty, graduate students, and undergraduates, as it does with many other countries around the world. So, I disagree strongly with the ASA boycott approach. Political disagreements with the government of a country should not limit our ability to reach out to and collaborate with academic institutions and scholars from that country on projects that we consider valuable. Here at UW-Madison, academic freedom continues to be our tradition and one of our defining values.